The case was first presented at the Centennial Celebration of Bacteriophage Research at the Institute Pasteur in Paris in April 2017. In late-2015, Thomas Patterson, PhD, a 68-year-old professor in the Department of Psychiatry at University of California San Diego School of Medicine, was stricken by a bacterial infection while on vacation overseas, later identified as a multidrug-resistant strain of Acinetobacter baumannii. Emergency treatment in Egypt and Germany proved futile and Patterson was airlifted to the intensive care unit at UC San Diego Health, where he subsequently lapsed into a coma after the infection spread into his abdomen and bloodstream. The proposed treatment was novel in both approach and scope. Robert Schooley, MD, professor of medicine, chief of the Division of Infectious Diseases at UC San Diego School of Medicine and Patterson’s primary physician, and colleagues would intravenously and percutaneously (through the skin) administer a cocktail of “phages” personalized to attack the specific strain of A. baumannii afflicting Patterson. Identifying and processing the phages to be used, some derived from sewage, would require an accelerated, global collaboration of colleagues, doctors and scientists. 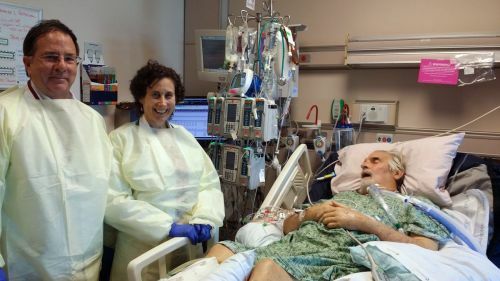 UC San Diego Health’s Robert Schooley, MD, and Randy Taplitz, MD, administer intravenous experimental phage therapy to patient Tom Patterson, four months after he contracted a multidrug-resistant bacterial infection in Egypt. Phage therapy is not a new idea. The approach has been explored for nearly a century, primarily in parts of Europe and the former Soviet Union. However, results were inconsistent and lacked scientific validation. The emergence of antibiotics in the 1940s largely pushed phage therapy out of mainstream interest and use. Most current therapies using phages involve topical or oral applications. Study authors say Patterson’s treatment appears to be the first time in the United States that a patient received intravenous bacteriophages to treat an overwhelming, systemic infection. Despite some setbacks — treatment was adapted as physicians learned on the fly — Patterson eventually recovered and returned to his normal life and work in April of this year. Schooley said Patterson’s case supports further study of phage therapy in patients suffering from multidrug-resistant bacterial infections with limited therapeutic options. He notes, however, that there are caveats and many questions yet to be fully answered. For example, Patterson’s case was a single, uncontrolled clinical observation. His improvement may be due to treatments unrelated to phage therapy, though events strongly suggest otherwise. More broadly, fundamental challenges to expanding the approach remain to be addressed. Bacteriophage therapy must be personalized to each patient because phages have evolved to attack specific species of bacteria. Every patient is, in effect, a clinical trial of one. Currently, there are no systems, infrastructure or rules in place to create and sustain an acceptable, safe, broad-based process for using phages.